Great genuine watch with great speed of delivery. Perfect Watch. Looks fantastic! Excellent value for money looks far more expensive than it was. It stands out on the wrist ans has been admired by so many people of all age groups. So pleased. The watch is amazing, my boyfriend loves it! It was an excellent Valentine’s Day present. love this watch you can see the quality just by looking at it. Bought this watch as a well done present for my brother for a massiv promotion at work, he was over the moon with it, its a absolutely beauty of mans watch. Love this watch, lovely colour to it. Nice and heavy and feels expensive. Although i took 3 links out its still quite loose and if I take another one out its too tight so it would be good if they had one half the size of a normal one so it would fit perfectly on my wrist, apart from that I would recommend! The watch looks and feels expensive. It is a very smart watch that will go with whatever you are wearing. Brilliant quality. Quick delivery. Everything is awesome! Amazing quality super fast delivery will definitely using the watch shop again in future 10/10. 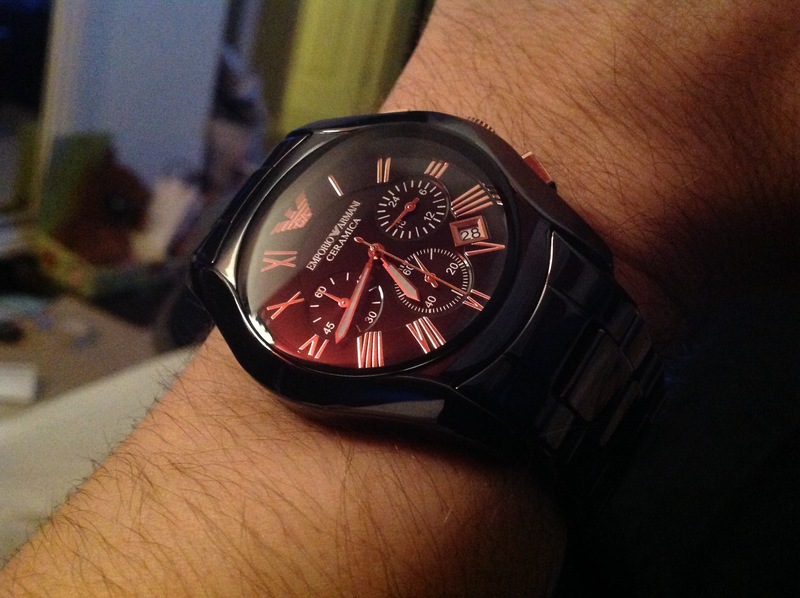 I purchased the MENS EMPORIO ARMANI CERAMIC CHRONOGRAPH WATCH after doing lots of research on the watchshop. The watch was over a hundred pounds cheaper than on the high street and I was worried that the price was too good to be true. I had discarded many online retailers due to the worry of receiving a fake but after researching, decided to make my purchase from the Watchshop. The watch came within a couple of days and is absolutely gorgeous. The watch and packaging were both in perfect condition and I couldnt be more pleased, in fact I have just made a second puchase......says it all really!! Lovely watch, and watch shop had a adjusted the strap before receiving to the recipient of the gift could wear straight away. The watch looks lovely, I bought it as a 60th birthday present for my partner, I havent given him it yet but I know it is one he has had his eye on for sometime. Lovely time peice. Wife bought it me for my 50th birthday. Makes an old man look bling! The ceramic gives it that edge over other models in my opinion. Only wearing it for best so not worried about the fact its a bit more delicate than others. Will wear my other watch when Im out on the lash with the boys! Fantastic service and speedy delivery. I will be buying all my watches from here. Thanks again. Just received my watch this morning delivery was excellent just on time. 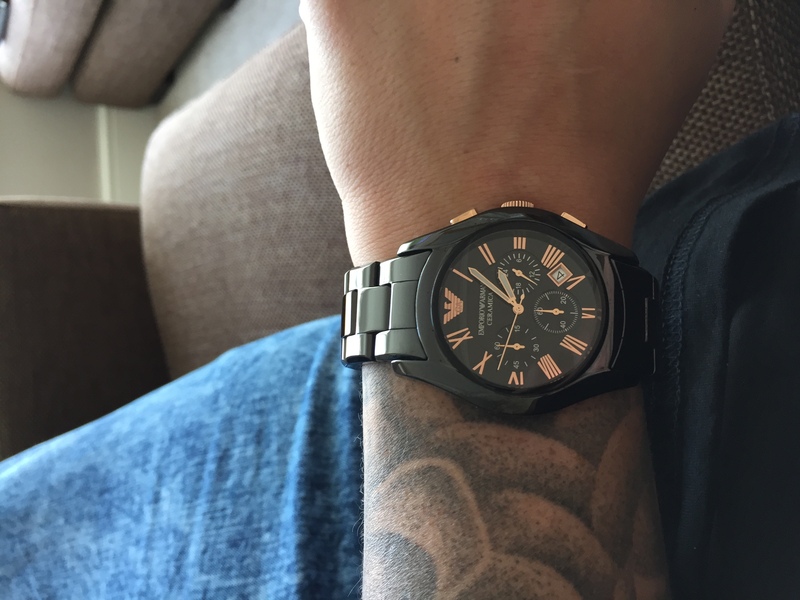 This Armani watch is beautiful like the quality what I was expected. I will recommend this website to all my friends really good service and prices ! The watch itself is stunning. The images do not give clarity enough as to how good it looks in person. Its a ceramic watch which means you have to handle with care but when you look after it, its a watch you will always love and itll never let you down. Honestly I have nothing to dislike about his watch as it is superb and very high standard. You would not be disappointed in buying this, it was worth every penny and would certainly recommend. Quick delivery. Nice watch. Would recommend. Very happy. Fantastic watch, just as it shows in the pictures. Amazingly fast delivery and great service at Goldsmiths. 100% satisfied. Excellent watch, fast delivery.. The sterling care from Goldsmiths also gave me peace of mind, now I know if I break it within the next 3 years they will repair it for free! watch arrived the following day, packaged well, brilliant price. Have returned today purely because Ive chosen an alternative one for my husbands 10th wedding anniversary present. Return seemed straight forward only sent today hopefully the refund will be processed quickly too. Would highly recommend company. Stunning watch, looks the part and at £100 cheaper than most jewellers who sell Armani. Bought for my sons 21st birthday and will be a lasting memento of the day. Needs links taken out which we havent had time for yet. A very classy item of mens jewellery. Excellent Service. Removed links to fit wrist size. Watch is excellent too. Absolutely stunning watch! Bought for my boyfriends birthday and glad I went for this one. Has a good weight to it and certainly catches the eye. Would highly recommend. This watch is beautiful. The ceramic makes it so glossy and it gets noticed! The quality is amazing and the rose gold against the black looks great, it has a nice weight to it too! The links on the strap make it awkward for most wrists if you want it to fit perfectly as it will either be a bit loose or slightly tight! I can live with it! Highly recommend! Excellent watch. Looks great on. Real quality product. This is an investment, especially at the price. Absolutely stunning watch. Purchased for my partner for Christmas. Extremely happy with it. Absolutely love it. 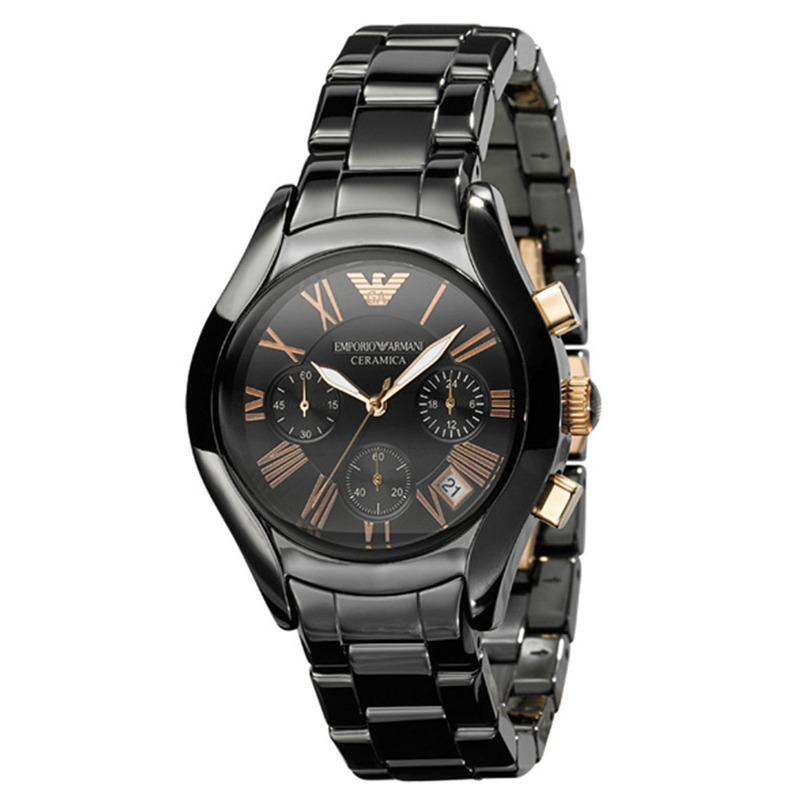 Ive always wanted a brand name watch with style, and Emporio Armani certainly fits that bill. Love the black ceramic bracelet with rose gold face. If you want a watch for either business or pleasure this is the one I really recommend. Really stunning watch, bought as a gift for my husband for christmas so im hoping he will love it! Would definitely use watch shop again, i got a real bargain as other high street shops were charging almost double the price! Also free next day delivery which was great. The watch itself is even nicer than it looks on the photos and is really heavy and solid, would recommend! Beautiful watch, nice weight, great clasp, Sleat design. Instructions are difficult to understand when initially setting the watch but overall a great addition. This watch is so stylish and of great quality. Got delivered to Goldsmiths very quickly which is a great help Watchshop offer this service as I was able to get the links done straight away! The staff in the shop were so helpful and generous with drinks! Will definetly purcahse from you again!! Absolutely stunning, gorgeous detailing. Well worth the money. Bought as a Christmas gift for my husband. Really stylish looking watch and different with the ceramic wrist band. Excellent watch and would recommend it to anyone who is thinking of buying. I got good service from Watch Shop in terms of communication and delivery time. Will shop here again definitely. 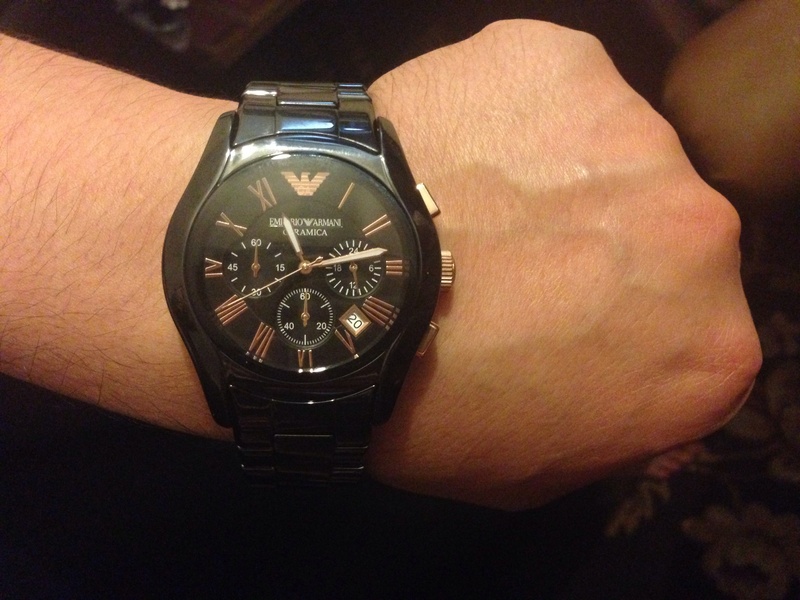 I purchased the Emporio Armani watch . It is very nicely fashioned and beautifully made .The watch ,though a little heavier then other watches I have worn , is extremely comfortable to wear and it really stands out when worn . If your looking for something different then you cant go wrong with this watch . the start the watch shops price match , and customer service was just fantastic and finally the free wrist adjustment . Tried this watch on in a well known jewellers but decided to order online because of the price difference which was considerable. The watch is beautiful. Black set off with rose gold. I have a fairly slim wrist so included my wrist measurement on my order. Received the watch in two days already altered to fit. Love my new watch. Ive got this beauty today. I love everything about this watch,colour and style. This is defenetly a man watch. Worth every penny I think. Love it! A genuine product from this company, no fakes sold like on eBay. Delivery was fast and website easy to use. Will buy from these people again and recommend them to others. 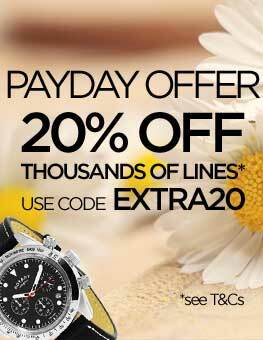 Watch shop has a fantastic range of watches which made my online shopping experience very easy, stress free and enjoyable not had I seen the watch i wanted there was interest free finance available & next day delivery. Once this was confirmed one day it was delivered the very next day!! I intend to make a second purchase from Watch shop very soon. Id recommend using the Watchshop as theyre very professional, easy to use and quick, it takes all the hassle out of driving into town and getting parked, my kind of shopping. The watch looks good in appearance. The rose colour contrasts nicely with the black. Love this watch, it oozes quality. Feels sturdy yet looks elegant. The rose gold coloured accents add a welcome touch of colour to the slick black ceramic and the underside of the face. Good solid clasp Excellent value for money. 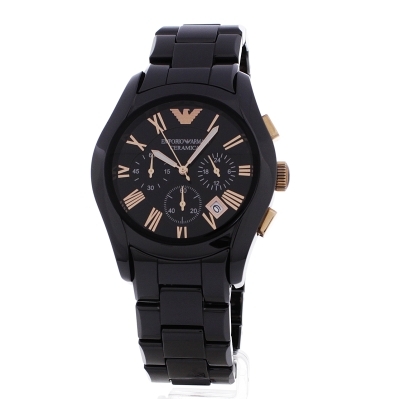 The Emporio Armani watch was a great gift the dials really stood out and the colour Black and Gold looked really nice. The service was good to spoken to nicely. Great Gift Thankyou. Excellent watch and delivered within 24 hours of ordering! The bracelet is ceramic and the watch face is very contemporary. Unfortunately broke the watch a very small piece of the link. Could not get a reply in time so have to fix it privately. Next day delivery was brilliant. That was excellent service. Gift wrap was a great help too as he couldnt see what it was, great surprise. Was brought for my partners birthday and he loves it! Looks really fab on and makes any out fit complete. Really glad I went with the rose gold option as its quite unusual and really makes it stand out from the norm. Brilliant watch. Good value for money - thanks to Watch Shop. This watch looks great and is finished very well. Very happy! Fantastic watch really screams quality without showing off too much. Catches the light well and stands out from other watches. Will not b disappointed from purchase. Being ceramic will have to be careful especially when changing links highly recommend this be done by an average expert. I bought this watch as a Christmas present for my boyfriend. 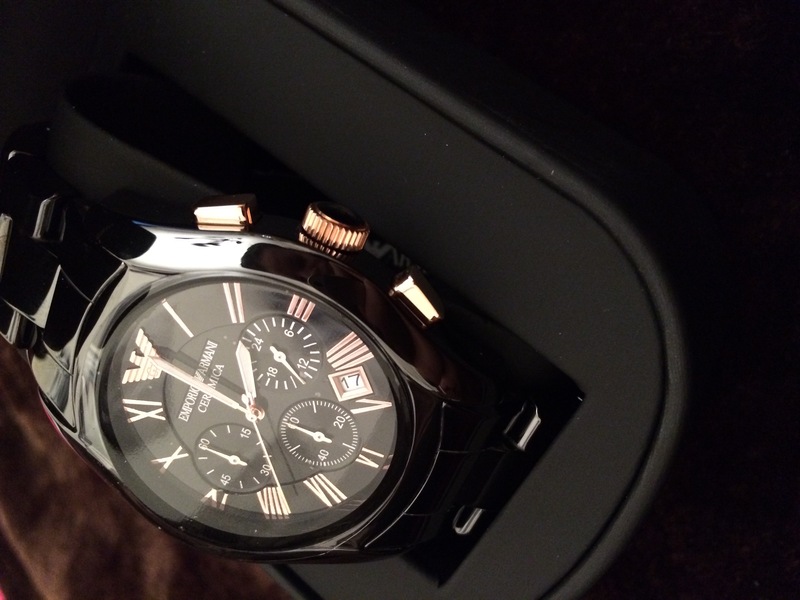 Its a stunning watch and looks very classy being all black ceramic with rose gold dial and buttons. Its a good weight but not too heavy. Would definitely recommend this watch. Lovely looking watch the Rose Gold contrast on the Black complements the look of the watch. The shiny braclet is very striking . The features of the watch are great chronograph dial! Really pleased I bought it for my son & he loves it! I brought this watch for my partner as his Christmas gift. Its absolutely beautiful. The black ceramic is light and the closing mechanism is very easy. The Rose gold contrast with the black is great the pictures online really do not do this product justice. Times are easy to configure and the presentation box was the finishing touch to the gift. I would thoroughly recommend this watch to everyone. This watch is much better than the picture. Clear easy to read face. Watch is stunning and excellent quality. Nice look and feel when worn. Was bought as Xmas present and definitely not disappointed I looked at a few other watches but opted for this one and glad I did, the gold detailing against the black sets the watch off nicely. A very stylish and classy looking watch. The rose gold makes the features stand out. The hand on the seconds stopwatch function does not hit the marks exactly but if I wanted timing accuracy I would have bought a digital stopwatch. I have admired this watch at arms length for a while and so happy i finally got to purchasing one. I have had so many comments on how nice it is, and personally i love it. The finish is perfect, the face is clear and it is very easy to read the time on it in most light conditions. 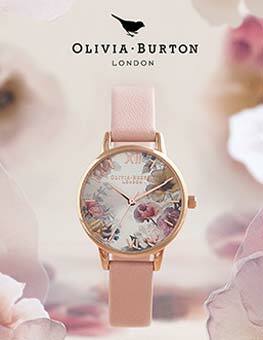 This watch is the perfect finishing touch to being dressed for a night out !!. This Armani black and rose gold watch is 100% better looking in reality than any picture demonsrated. The weight gives this watch a sturdy and expensive looking feel. The face is rich looking and clear to see. The bracelet is an expensive looking ceramic black bracelet. Thecwatch lookscgood, feels great and looks more expensive than the the actual price ticket. Any loved one will be overcome moon to receive this watch as a present. Cant wait to see my husbands face on Christmas day. This is a lovely watch, looks even better in real life than what it does in the picture. The black and rose gold colour of this watch gives the watch a very trendy yet also very professional and sophisticated look, meaning that this watch is perfect for all occasions. The watch is also slightly chunkier than the womens version of the Armani ceramica watch which gives it a more masculine look. This was bought as a gift for a family member who loves it and the watch shop had the best online price for this item. I would definitely recommend this watch to anyone who is looking for a very attractive, versatile and high quality watch. Great style watch looks better than the pictures. 100 pound cheaper than the shops very happy with both the watch and the service. This watch is really lovely - a good size not too big or too small, the dial has a lot going on and the bracelet is very solid. Presentation is perfect - you know that you have a luxury watch before actually seeing it. 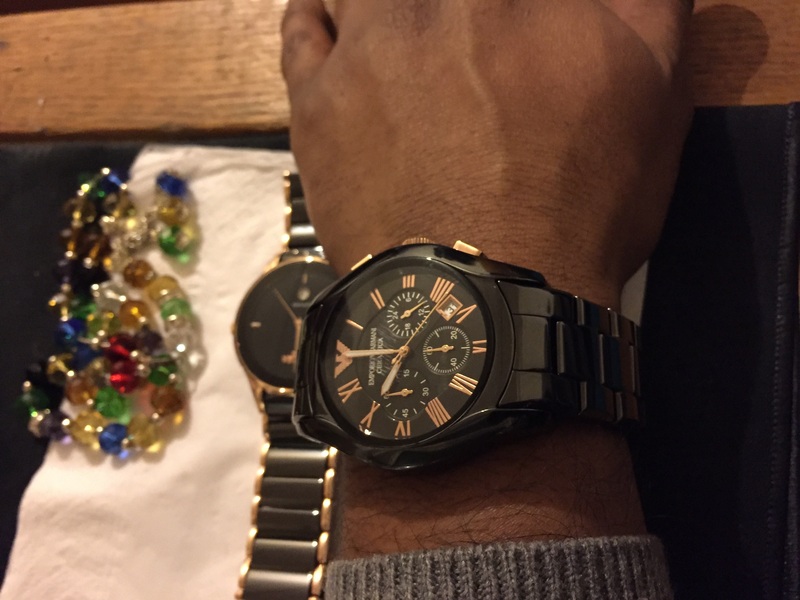 The watch I bought is just amazing..I like the colour combination that is gold and black..gives it a classy look..theres nothing not to like about an Armani..I personally would like to say is the service and the product I got from the watch shop are both excellent and outstanding. Bought this watch for my now husband as a present on our Wedding Day. He loves it. I got it made to size but unfortunately its a bit tight so need to get a link added back in. But apart from that it looks fantastic and the rose gold detail matches the rose gold details in his wedding ring. The watch arrived really quickly and was packaged well which was great. We bought this watch for our sons 18th birthday. He had looked and tried on a number of watches in stores at our local shopping centre and had decided this was the one he liked the best. The stores all had this watch on sale for £500.00! We did a little research on the internet and found this website, and the watch, which was an incredible £150.00 cheaper! We were a little worried we were buying blind but we didnt need to. The watch was sent promptly, and we had an update on its wereabouts throughout. It was delivered the very next day. The only thing which we could complain about was that we had given a different delivery address due to the fact that we wouldnt be in, but it was still delivered to our home address. This meant we had to pick it up from the local post office delivery unit, which was a bit of a pain, not to mention our parents stayed in all day waiting for the delivery! A fantastic watch, love the colour contrast and the design. Great attention to detail, looks the business! Brilliant watch. Its very classy and stylish and has a nice weight so that you can feel it is there. I would 100% recommend this watch to anyone looking for a top class watch. The service from Watchshop was just as good as the watch arrived the next morning for no extra charge. The watch is exactly as it looks in the pictures and feels even better on. Very impressed with the watch I bought. Fast delivery. 100% satisfied. Will definitely be using watch shop again, thankyou. Bought this for my husbands 50th he will love it beautifully watch a lot nicer in real life. Its stunning cant wait to give him it looks a lot more expensive. 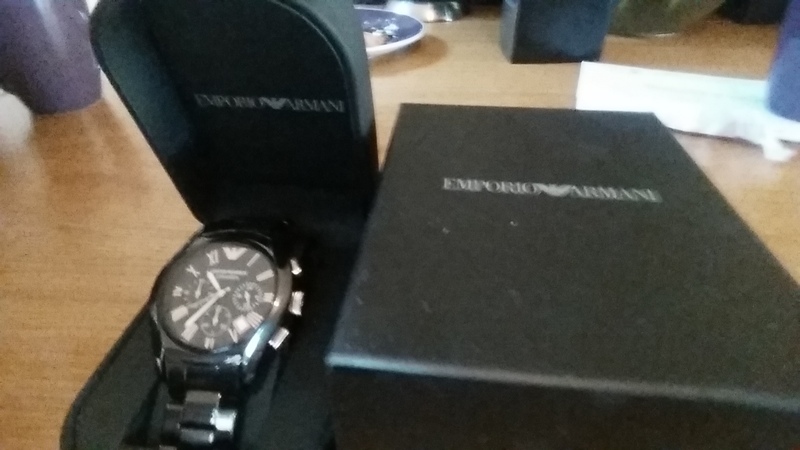 Excellent watch bought for my sons 21st birthday at a saving of £125 from the high street jewellers we had been to. Delivery was very quick and very efficient and was packaged extremely safely. No complaints and would happily recommend Watch Shop to my friends in the future. Perfect, just what I was looking for. Great quality, looks amazing, sure he will love it! The watch is excellent in style and class. 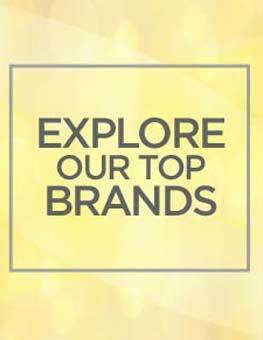 It is both alluring and practical whilst carrying a brand which is know for its fashion sense. The only issue is the watch strap. It would be useful for places to be identified that could adjust the strap. This watch was even more stunning in real life than the picture. Definitely the best watch i have ever bought. Jet black with the contrast of the dark gold colour of the crowns and roman numeral hour markers gives this Armani watch a lot of wow factor. Fine detail is eye catching and attractive. 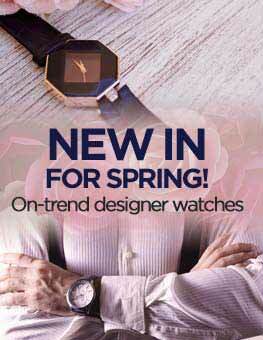 A durable and innovative watch for all occasions. Very happy with my purchase, worth every penny. This watch is absolutely gorgeous, looks much better in real life than the images and the video. Its a great gift, the black shiny ceramic definitely compliment the gold features, looks very expensive. Not too big and not too small, will definitely recommend to buy this! I wanted a black watch with subtle rose gold features. It looks elegant.Presentation, look, functions are very good. It was well appreciated. As a whole I am very happy with the order. However, there has been a misunderstanding with the bracelet - I have given the size in centimeters /pointed out explicitly/ but someone has written by hand on the orderform the same figure in inches which resulted for me receiving the watch with a very wrong bracelet lenth. So I woud recommend this shop for the watches but I will not recommend the customers to order bracelet fixing. 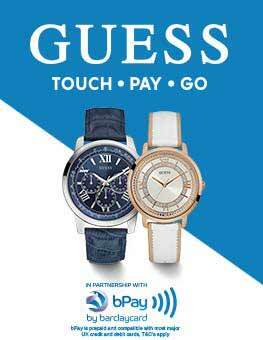 great product, very smart looking watch, stylish and eye catching! 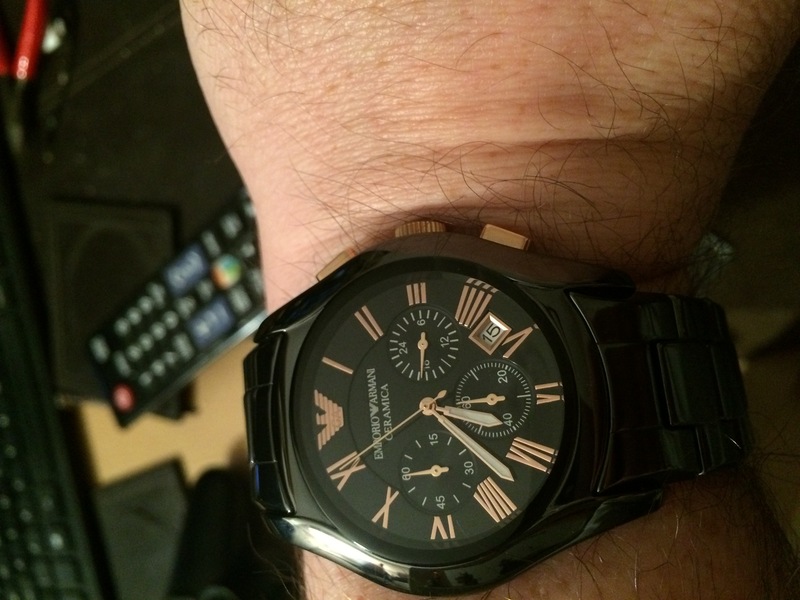 another great watch from the armani collection! No matter what I say or any picture I attach it wont do this watch justice. It is obviously quite an expensive watch but I believe you get what you pay for. All of my friends & colleagues have commented on how nice, and unusual, the watch is. I guess that is because the style is somewhat uncommon. The shine of the black ceramic finish is complemented perfectly by the rose gold. Whilst the watch is certainly eye-catching it remains subtle & goes perfectly with any suit. I did have some reservations about purchasing this as I was worried it would be too big. However, as you may have guessed, I couldnt be happier & cannot recommend this enough. Just as described and a fab buy!!!!!..... Bought as a present for my 40th birthday so it was a risk....... But he loved it! The picture is a true likeness of the actual watch. It is very heavy in weight and feels as expensive as it looks. The ceramic amrmarni watch is one of pure class. The ceramic mixed with rose gold sets it of beautifully. This really does fit in nicely without looking too flashy however the armarni markings on the face and crown of the watch make the watch stand out from the rest. If you are going to buy my only recommendation is to know roughly the number of links that will need removing and get this done by Watch shop, as I was turned away by three jewellers because there is a high risk of the ceramic tile cracking which means a £90 fixing bill!! But Defo worth every penny!!!! Good watch..very classy giving it as a wedding present looks nice and worth it. shiny and black very classy looks better in real life than in pictures. Stunning watch, worth every penny. The watch is packaged very well in a way to present itself to you, the first time i saw it i just said wow! The dark colour of the watch really does compliment the rose gold numericals and dial. Bought this watch fr myself to wear on nights out and just in general, would definately advise anyone to get one. Buzzing with it i am. The item was received within time limit stated. Heavy weight ceramic. Elegant unique to a normal everyday staess steel. It has rose gold dials which are very suttle. Beautiful would purchase a similar product again. 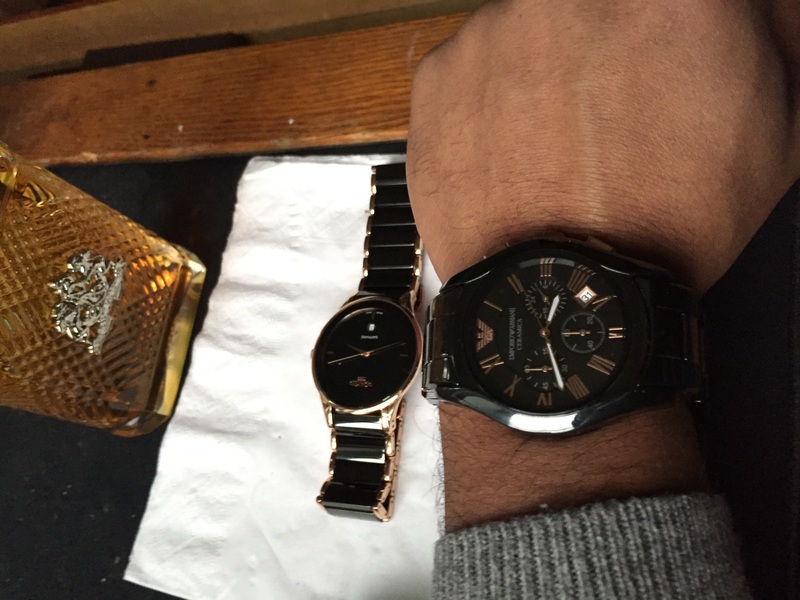 The only thing was different in the pictures the watch looked very large but it is a aberage size mens watch. 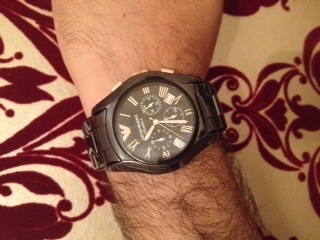 Very happy with the Armani watch which is a Christmas present for my husband. Excellent service & speedy delivery. Arrived quickly and looks great! Looks exactly as shown on the website and in lovely packaging. 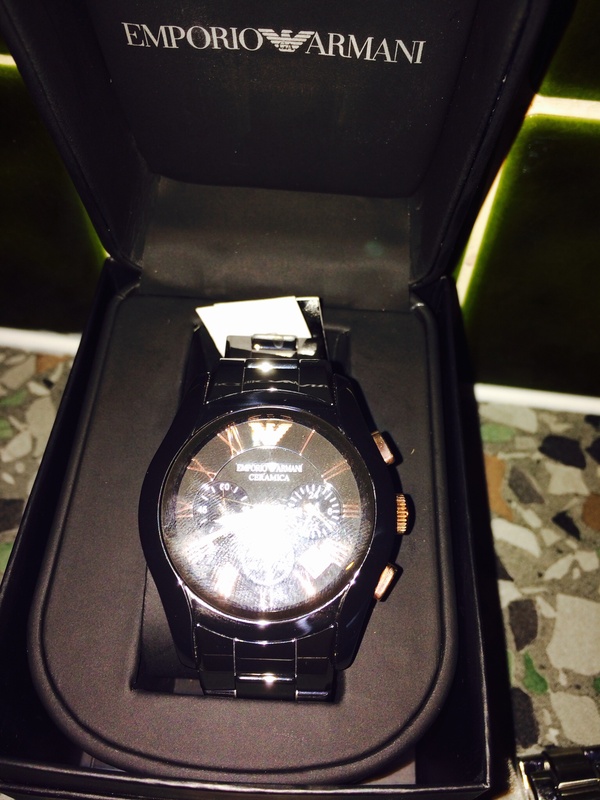 A birthday present for my partner who seems to like Armani watches, had no problems in the past. a great quality watch. Heavy, and feels substantial. I am very pleased with my purchase and hope my husband loves it too! Fantastic watch. Beautifully made and a great price after price match discount. The glossy black ceramic gives it a great look. The service from watchshop was also outstanding. I bought this watch as a wedding gift for my husband to be. It is a stunning watch and photographs dont do it justice. The detail is fantastic with the logo used tastefully throughout. The quality is fantastic and I cant wait to find out what my fiancé thinks. I know hell love it! Beautiful and worth every penny! Excellent service and prompt delivery! 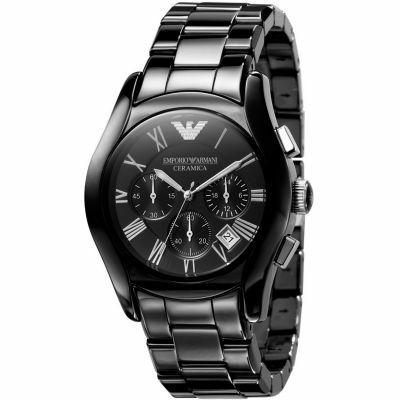 I scoured the internet to find the best price for the mens Emporio Armani Ceramic Choronograph watch, I couldnt believe Watch Shop price matched each time I came back with a cheaper price. I decided to finalize my purchase with Watch Shop rather than the other retailers because it offered free adjustments, free delievery and a 30 day hassle free return policy which was nessacary because I purchased the watch for my husband who l was going to visit in the middle east and incase he didnt like the colour I still had the option of exchanging it upon my return. Due to some bad expreinces shopping online I carried out some research and overall watch shop had excellent reviews. I also saw the advert on TV which gave me more reassurance that it wasent some dodgy online retalier selling repilcas. I would highly recommend! My Husband loved the watch and was very happy indeed. Thank you Watch Shop! Watch as described! Looks a really smart watch and is worth every penny! Looks good with the rose gold. Would advise anyone to purchase this watch. Love this watch, its a nice weight not too heavy but still know you are wearing it. Black and rose gold goes well together. Working well so far and watchshop provided excellent service with prompt delivery. Lovely watch. Ive not really worn a watch regularly for years, mostly just when Im wearing a suit, but I saw the Armani Ceramica last year and wanted it. I put it off and put it off with it being £500 for something that I may well not bother putting on or just forgetting about. I eventually buckled and went for it. Within two or three days when I woke up in the morning and put my shirt on, I was already naturally picking up my watch. I have worn it every day since, and only take it off if Im doing something where it could be damaged. It looks good with any shirt I put on. My old watch I found looked strange on my wrist, the face was a bit small, but a lot of watches now seem to be trying to just have the biggest face they can and pull focus. This is really the perfect size. A few friends have tried it on with different sized wrists and it has looked good on each. Its quite subtle. The ceramic throws light in strange ways and changes colour slightly in different lights and looks amazing, I was unsure about the rose gold, but the contrast complements the dark ceramic perfectly. The only downside is that the links are fairly big, meaning that each link you take out changes the strap length considerably and so it is not possible to get a perfect fit on most people. That being said I was able to fasten the strap with 3 links removed but not comfortably, and so put one back in, so I am probably right on the small side of having two links out and it still fits so well I forget I am wearing it. I suppose the main thing is how it looks. It is expected it can tell the time, and that it should fit, and I cannot fault it. It isnt ostentatious. Its not a watch that constantly pulls focus. It is clearly a nice, expensive looking watch from a distance, but for all of the rose gold, and ceramic strap it is understated and respectable. Lived the watch. Exactly what I wanted. The colours even better in person than on the computer picture. Feels very sturdy and well made. Very happy with the watch keeps time and looks very classy. It a cut ally looks better when you have the product on your arm, like the colour. ...was looking for a watch around the £500 mark and the AR1410 caught my eye. When it arrived the detail and craftsmanship was stunning. Very impressed with the watch. Firstly I would like to say the service of the watchshop was fantastic. The watch was ordered at around 9pm and delivered two days later before 1pm. The watch itself looks fantastic and I am very pleased with it, well worth the money that I paid. The gold touches on the dial and chronography buttons are much nice in real life than in the pictures. The only regret I have is that I didnt buy it sooner. If you do bite the bullet and get this watch you will not regret it. Very stylish watch, looks expensive especially with the unusual colour of the watch and gold detail. Quite a chunky watch and looks great on. This watch goes well with almost any dress style. A very good buy to show off your wealth. Firstly, the watch looks great, The black ceramic is sleek and classy, creating an attractive contrast with the gold touches. It looks even better in real life than it does in the picture! A couple of small details I really like is the Armani symbol on the crown and the butterfly clasp (which also has a small engraved Armani symbol on it). All-in-all, it oozes quality. Also, the watch hands glow faintly in the dark. Although this might sound tacky, it's not - they don't exactly beam out; it's just for the sake of practicality. Keeping with practicality, I have also found the chronograph feature quite useful. I thought the chronograph aspect would merely add to the attractive look of the watch but I have used it quite frequently to time things exactly to the minute. It saves getting my phone out and starting a timer or trying to remember the time at which the activity started and then working out how long had gone. Especially helpful for me in an exam where all the clocks in the room are at different times! Now, a few minor bad points. I have quite a thin wrist and the watch face is bigger than I had anticipated (it looks bigger than it is in a picture). However, after getting the strap re-sized it looked fine. As the clasp is a butterfly clasp, you have to take out an equal number of links on either side of it and as a result it is slightly slack around my wrist. In honesty, this doesn't bother me too much - it's still comfortable to wear so the fact that it is slightly loose is fairly irrelevant (I realise that this is a personal perspective on this point but thought it might help some of you). Another negative - for some reason, the ceramic always gets smudges on it. I honesty don't know how it gets smudged so consistently but I always think it's scratched...until I wipe it of course. First world problems eh? The ceramic material is obviously scratch resistant and so is the watch face which was a good surprise. Overall it looks quality, it's comfortable and it feels great - it's quite heavy so it feels solid and proper. A few measly negatives but they shouldn't detract from what is an amazing watch from my point of view. Pricey, but it you really want it and settle for a substitute you will always regret it. the watch was beautiful got it at a right price. the delivering service was excellent and they sent you emails of where your parcel is in the procedure.i will recommend buyers to buy from here my. another great service they do is price match which is great. I WOULD 100% PURCHASE AGAIN. AMAZING BARGAIN!! The watch is of excellent quality. The watch is very pleasing on the eye. It was bought as a birthday present for myself & was extremely pleased with it. The strap was easily altered, by the watch hospital in town. Definetly the nicest watch i have ever bought. Very smart looking, and good quality. All my friends have said how nice it is. Expensive, but if you buy it you will see why. Well worth it. beautiful watch that is even more stunning for real than in its picture. Very comfortable to wear and a good weight which gives it the quality feel without sacrificing comfort. I have recieved compliments from pretty much everyone who has seen it. love it!